Use the Window - Preferences dialog pages to set how you want Web Image Collector to operate. You can browse the Preferences dialog pages by looking through all the titles in the left pane or search a smaller set of titles by using the filter field at the top of the left pane. 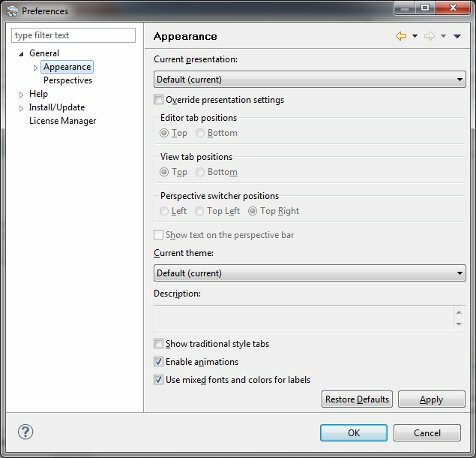 The results returned by the filter will match both Preference page titles and keywords such as "appearance" and "java". However, to find specific functions you may have to search the online help instead. General settings for the Workbench. The term Workbench refers to the desktop development environment. Always run in background Turn this option on to perform long running operations in the background without blocking you from doing other work. Keep next/previous part dialog open If this option is turned on then the editor and view cycle dialogs will remain open when their activation key is let go. Normally the dialog closes as soon as the key combination is release. Show Heap Status Turn this option on to display an indicator showing information about current Java heap usage. This preference page is used to set preferences for the look and layout of views in the workbench. Current presentation Specify the currently active presentation (look and feel). Override presentation settings Locally override the settings from the current presentation's defaults. Editor tab positions Specify either top or bottom to indicate where you want tabs for stacked editors to appear. View tab positions Specify either top or bottom to indicate where you want tabs for stacked views to appear. Perspective switcher positions Specify the location of the perspective switcher bar. Current theme Specify the currently active theme (color and font set). Show text on perspective bar Specify whether labels should be shown in the perspective bar as well as icons. Show traditional style tabs Specify whether traditional (square) tabs should be used in place of the curved tabs. Enable animations Enable/disable the feature where views animate to their location when closed or opened. Allows you to set the state of existing perspectives. Open a new perspective Use this option to set what happens when you open a new perspective. Do you want the perspective opened within the current Workbench window or opened in a new window? Open a new view Use this option to specify what happens when a new view is opened. It is either opened to its default position within the current perspective or it is opened as a fast view and docked to the side of the current perspective. Hide empty fast view bar Use this option to specify visibility of an empty fast view bar. If this preference is set and the current perspective doesn't contain any fast views, the fast view bar becomes invisible. 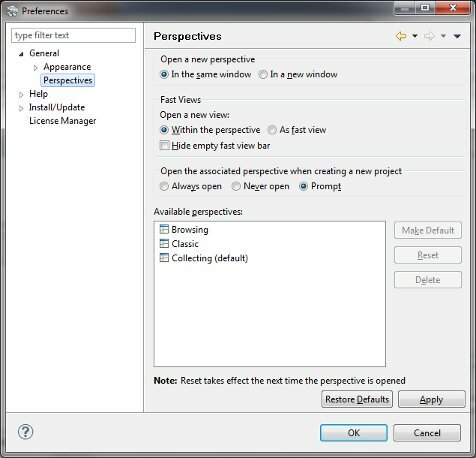 New project options Use this option to specify the perspective behavior when a new project is created. You can set it to switch the current perspective to be the one associated with the project type and open the perspective in the same Workbench window as the current one, switch the perspective and open it in a new Workbench window, or not to switch perspectives at all. Use this preference page to control where help is opened, as well as searching behavior. Open Help Search Configures whether Help/Search (and Help/Index if configured) opens the help view or help contents. Open help view documents This option allows you to determine whether the documents selected in the help view will be opened in-place, in the editor area or in a browser. 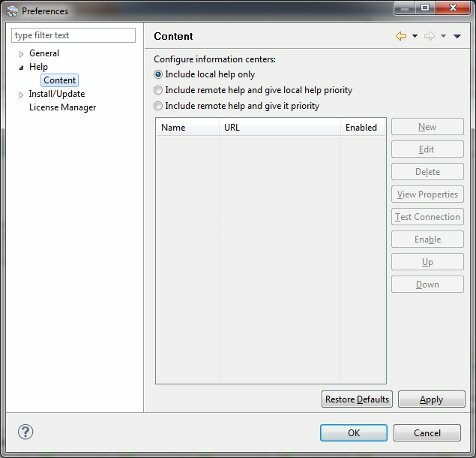 Open Help Contents Allows you to open help contents in an external web browser or in the Eclipse help browser. Use "Web Browser" preference page to select browser to use. 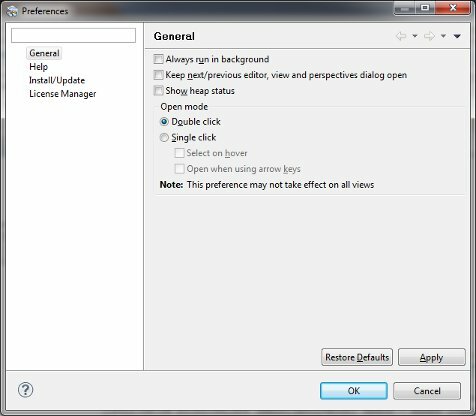 Open window context help This option allows you to determine whether the window context help will be opened in a dynamic help view or in an infopop. 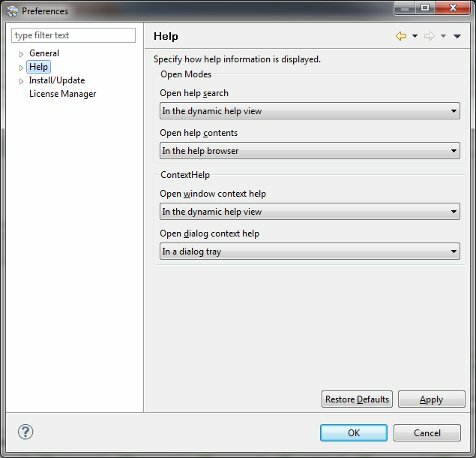 Open dialog context help This option allows you to determine whether the dialog context help will be opened in a dynamic help section of help view or in an infopop. Use this preference page to configure help to download help content from a remote server (an information center). Include local help only Remote help content is not enabled. Include remote help and give local help priority The help system will show locally installed help contents as well as help contents from the information centers specified in the table. If the same page exists both locally and on the remote information center the local page will be shown. Include remote help and give it priority The help system will show locally installed help contents as well as help contents from the information centers specified in the table. If the same page exists both locally and on the remote information center the remote page will be shown. Disable/Enable Allows a data source to be disabled so the help system will not try to read topics from that source. This page allows you to configure general install/update preferences. 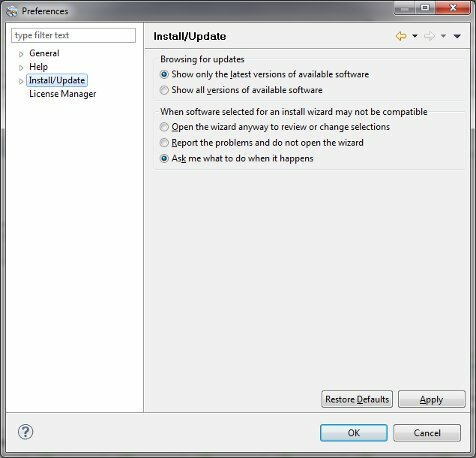 Browsing for updates This option allows you to configure what software versions are shown in the Available Updates wizard. You can select to show only the latest version of an update, or all versions of updates that are available. When software selected for an install wizard may not be compatible This preference allows you to configure how incompatibilities are reported. If you attempt to update, uninstall, or install software that is not compatible with the software you already have installed, you can elect to open a wizard to edit your software selections, or you can just have the problem reported in the error log without opening the wizard. By default you will be prompted about what you want to do in this situation. This page allows you to configure the preferences for automatic updates. Update Schedule Look for updates on each startup, or once a day or some day a week, at a predefined time. 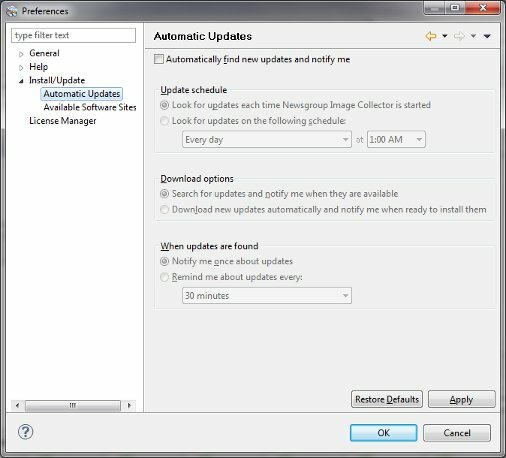 Download Options This option allows you to choose between having Eclipse search for updates and notifying you of them once they are available or having Eclipse automatically download new updates and asking you to install them. When updates are found Choose to be notified about new updates only once, or to receive reminders until the updates are installed. 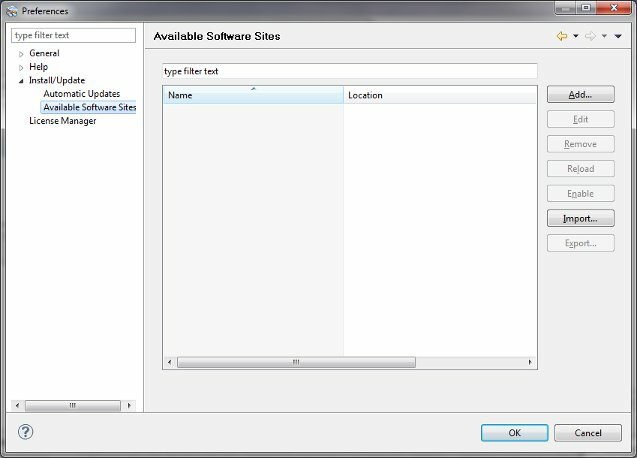 This page allows you to add and remove software sites, or select the sites that should be consulted whenever you install new software or update your installation. Add/Edit/Remove Add, edit or remove a software site. Test Connection Tests to see if it is possible to connect to the selected software site. Disable/Enable Allows a software site to be disabled so that the update system will not try to find software on the site when updating or installing software. Import/Export Import or export the list of software sites from a file. 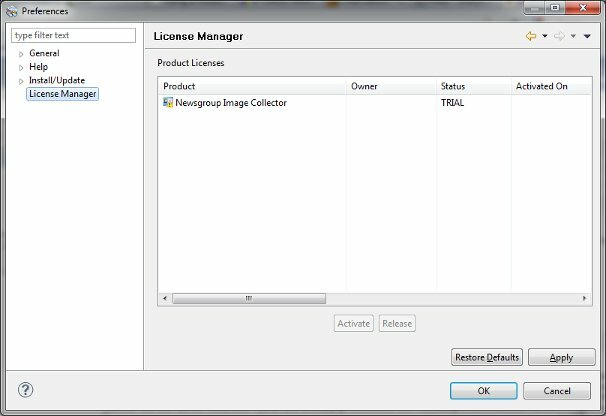 The license manager shows all the current licenses found in your product. Use the license manager to activate, release, and purchase new licenses. Activate Activates the selected license. Release Releases the selected license. Projects are a way to organize image collections based on how and where they are downloaded from. Projects can be exported and shared with friends or backed up to other locations. 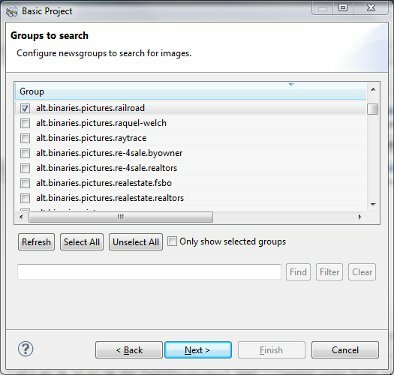 The Basic Newsgroup project will create a new image collection based on one newsgroup server. 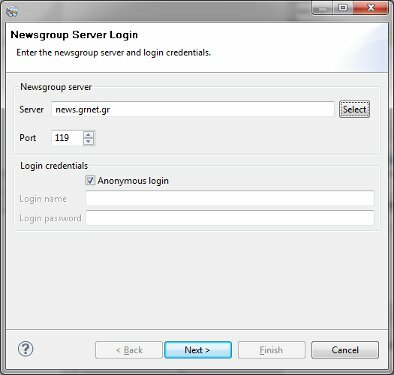 The newsgroup server may have any number of groups and you can select which groups to add to the project. The following lists the pages used when creating a new basic newsgroup project. The following lists the pages used when editing a basic newsgroup project. New project settings are a part of creating a new image collection. These settings let you tune the search process to include or exclude images based on a variety of options. When creating a new project, you will be presented with a selective amount of settings. To see all settings available, use the project properties after the project is created. These settings are for specifying the newsgroup server to download images from. Newsgroup Server This is the newsgroup server host name. This can be either an IP address like 192.168.0.1 or a name of a newsgroup server such as news.giganews.com. Select button This button will open the host selection dialog box which has a list of free and paid newsgroup servers. 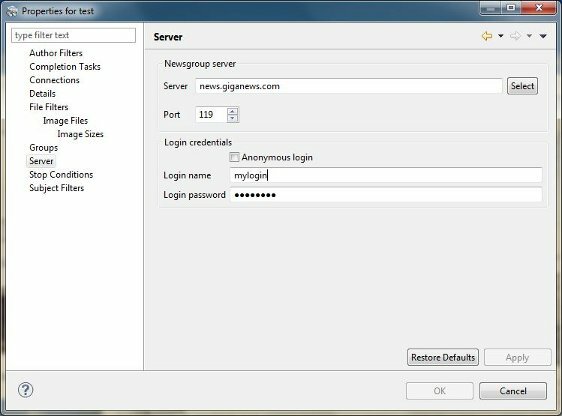 Select a newsgroup server from this list if you do not have your own newsgroup server to use. Login Credentials If you have an account with the newsgroup server, you will need to enter your username and password here. Otherwise leave the anonymous login checked. These settings are for specifying the news groups to download images from. Groups These are the newsgroups available on the server. Click the check box next to each group to download images from. Refresh This button will replace the currently listed groups with a fresh list of groups from the server. Select All This button will check all check boxes for each group shown in the list. Unelect All This button will uncheck all check boxes for each group shown in the list. Find This button will locate the a group in the list that contains the text entered in the text field. Additional clicks of this button will move to the next match in the list. Filter This button will remove all groups from the list except those that contain the text entered in the text field. Click the refresh button to restore the full group listing. Clear This button will remove any filter if one is applied. These settings set restrictions on the image width, height, and file size. You can specify a minimum width, height, both or none. For example if you set a minimum width of 50 and a minimum height of 50, all images smaller than 50x50 are skipped. You can leave the height unchecked and just specify a minimum width of 50 so that an image of 60x10 is downloaded. If you leave both width and height fields unchecked, this filter is disabled. Width - This is the smallest allowable image width in pixels. Images with a width smaller than the number here will not be added to the image collection. Height - This is the smallest allowable image height in pixels. Images with a height smaller than the number here will not be added to the image collection. You can specify a maximum width, height, both or none. For example if you set a maximum width of 500 and a maximum height of 500, all images larger than 500x500 are skipped. You can leave the height field unchecked and just specify a maximum width of 500 so that an image of 60x600 is downloaded. If you leave both width and height fields unchecked, this filter is disabled. Width - This is the largest allowable image width in pixels. Images with a width larger than the number here will not be added to the image collection. Height - This is the largest allowable image height in pixels. Images with a height larger than the number here will not be added to the image collection. This option allows you to set a minimum and or a maximum file size in kilobytes (KB). 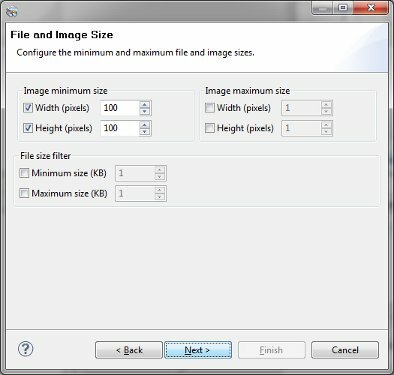 When images are downloading, they are compared to these options and if the file size does not meet the minimum or maximum settings, the image will not be added to the image collection. Minimum size - This is the smallest allowable file size in KB. Images smaller than the number here will not download. If this field is unchecked, this option is ignored. Maximum size - This is the largest allowable size in KB. Images larger than the number here will not download. If this field is unchecked, this option is ignored. This is where you name the project before it is created. By default the project will save to your workspace location, however you can change this and save the project wherever you like. Project name The name of the project. 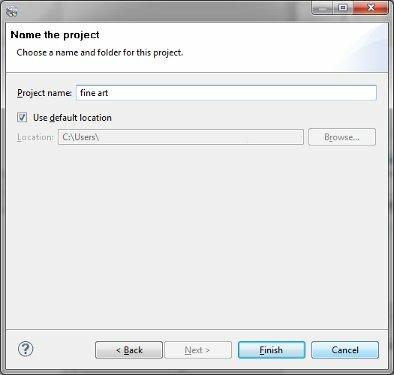 Use default location This option lets you change the default location of the project. All projects have settings that are configured when a project is created. These are called project properties and they can be changed by launching the project properties dialog. Select the project in one of the navigation views. Click Properties on the pop-up menu. These settings are for specifying the filter of including and excluding articles and their image content	by matching keywords or regular expressions (regex) against the article author. The author is the person who posts a newsgroup article and image to the server. Sometimes you may want to skip images posted by certain authors to avoid junk images. Sometimes you may want to download only images posted by certain authors. When a keyword or regex in the list matches an article author, that article's image is either downloaded or skipped depending on this filter's mode. Author Filter This is the list containing the keywords or regex values to compare against article authors. 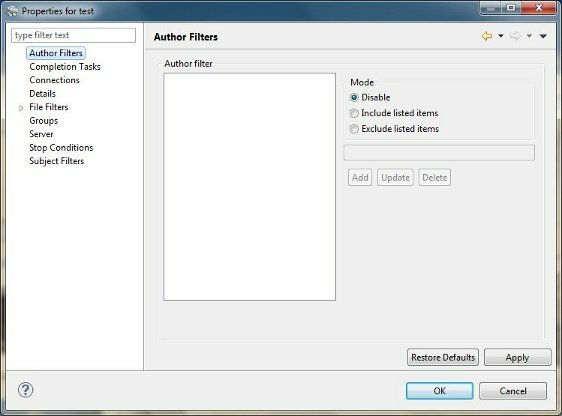 Disable - This option will disable the author filter without the need to remove entries from the list. Include listed items - This option will include all articles that contain one or more items in the list. This option results in a very limited set of results. 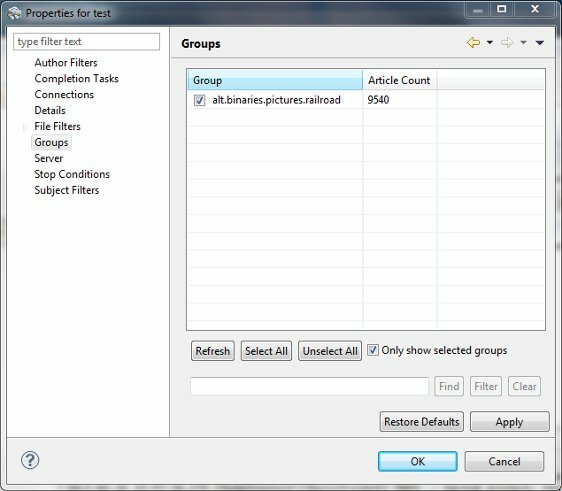 Exclude listed items - This option will exclude all articles that contain one or more items in the list. This option results in a clean and more specific set of results. Regular expressions (regex) are special text that describes a pattern to match within text or in this case within the article poster's name. These settings control the behaviour of connections to newsgroup servers. 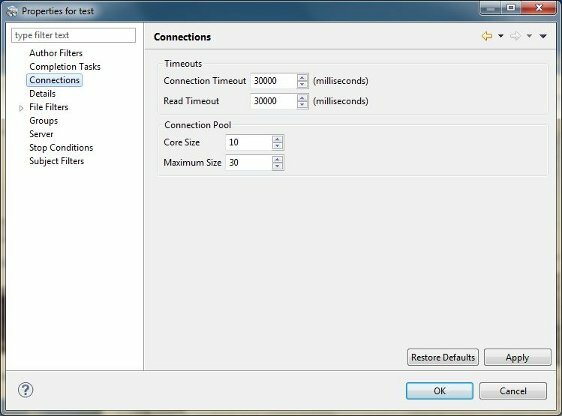 Use these settings to control the connection timeouts and the number of simultaneous connections. This option is used for tuning the communication with newsgroup servers. Connection timeout - This timeout is used when attempting to connection to a newsgroup server. Read timeout - This timeout is used when downloading a file from a newsgroup server. This option is used for controling how many connections can be active at the same time. Core size - This is the base number of active connections. Maximum size - This is the maximum number of active connections. These settings control image file storage to your computer. These settings are for processing duplicate images. An image is a duplicate if there is already an image of the same file name downloaded to the target folder. Skip duplicate files - This option will skip (not download) duplicate images. Overwrite duplicate files - This option will download and overwrite duplicate images. 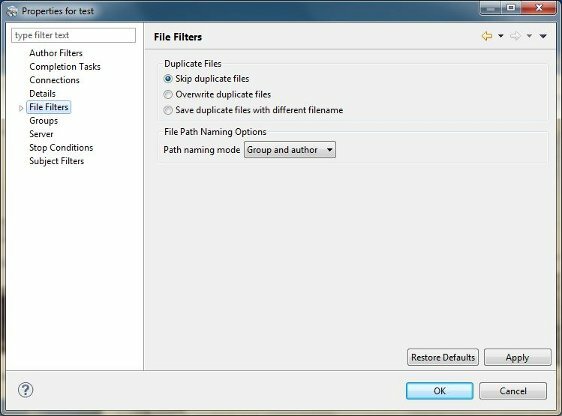 Save duplicate files with a different name - This option will download and save the duplicate image with an index such as (1) or (2) in the filename. This setting controls the naming of each image target folder within the project. Use this option to control how to group images as they are downloaded. Group and author - This option will create a main folder with the newsgroup name, then a sub folder with the posting author. Group and subject - This option will create a main folder with the newsgroup name, then a sub folder with the subject. Author - This option will create a main folder with the posting author as the name. Subject - This option will create a main folder with the posting subject as the name. Group - This option will create a main folder with the posting group as the name. These settings control the filter of including or excluding images based on the file types and sizes. This filter can ignore the listed file types or it can download only the listed file types. Disable - This option will disable the filter without removing list entries. Include listed items - This option will include all images that match any of the size items in the list. This option results in a very limited set of results. Exclude listed items - This option will exclude all images that match any of the the list. This option results in a clean and more specific set of results. These settings control the filter of including or excluding images based on the width and height of the image. 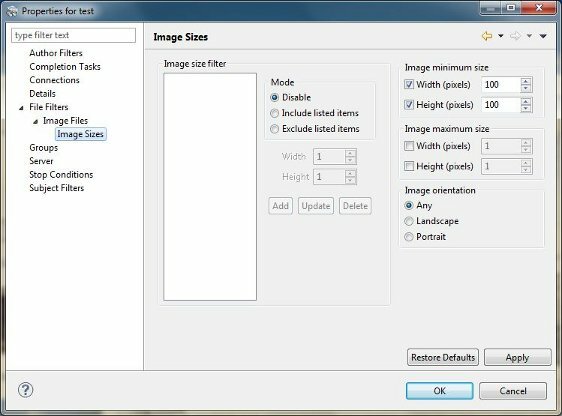 This page includes a size list for specific image dimensions to filter, and it includes a minimum and maximum dimension filter. As images are downloaded to your computer, they are compared to the settings on this page to determine if the images should be downloaded or skipped. You can specify exact sizes of images to include or exclude in this filter. For example if you want to download only 800 x 600 and 1024 x 768 sized images, you can set an include filter with these two sizes. 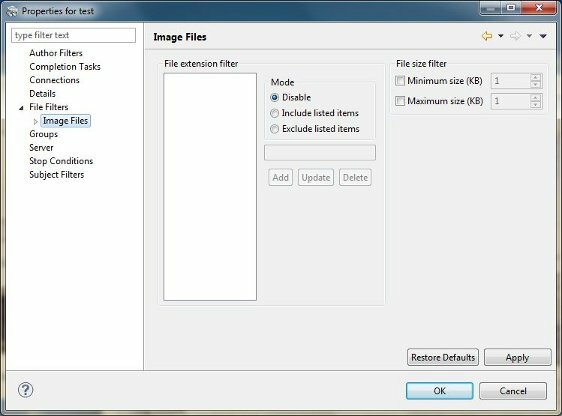 Disable - This option will disable the image size filter without the need to remove entries from the list. These settings are for specifying the filter of including and excluding articles and their image content	by matching keywords or regular expressions (regex) against the article subject. Each article posted to a newsgroup server must have a subject just like an email message. Sometimes you may want to skip images posted with certain subject content to avoid junk images. Sometimes you may want to download only images posted with specific words in the subject. When a keyword or regex matches any article subject, that article's image is either downloaded or skipped. Subject Filter This is the list containing the keywords or regex values to compare against article subjects. 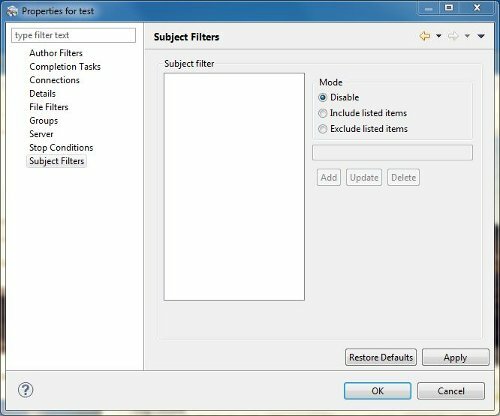 Disable - This option will disable the subject filter without the need to remove entries from the list. Subject: Who let the elephant out? Subject: WHERE IS MY PUPPY YO? These settings are used to perform optional tasks when the project collection process is complete. These options control if the completion tasks will execute and when. Enabled for stop conditions - This option will enable the completion tasks to execute when any of the conditions in the stop conditions settings are met. 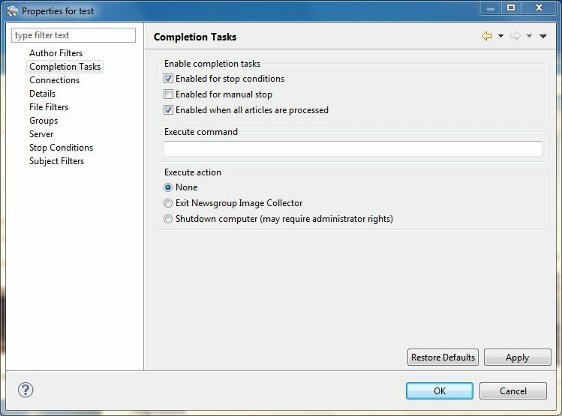 Enabled for manual stop - This option will enable the completion tasks to execute when you click the stop collecting button. Enabled when all URLs are processed - This option will enable the completion tasks to execute when all URLs are searched and the collection process ends. This command can be executed as a completion task. You must include the full path of the program to execute and any arguments needed to execute. Leave the field empty to disable the execute command. These additional actions controntrol the program and your computer. None - This option do nothing as an execute action. Exit Newsgroup Image Collector - This option will close Newsgroup Image Collector. Shutdown computer - This option will shutdown your computer. Your user account must have administrator rights on Windows, Mac, and Linux in order to successfully shut down your computer. These settings are used to automatically terminate the collection process of the project. In many cases the collection process can run for a long time resulting in unknown results. Use this feature to control the collection process and limit the download results. This option will stop the collection process when the specified number of files are downloaded. If any files are currently downloading when the number of files are reached, they will continue to download. This option will stop the collection process when the specified total size of files are downloaded. If any files are currently downloading when the total size of files are reached, they will continue to download. This option will stop the collection process based on total duration or clock time. 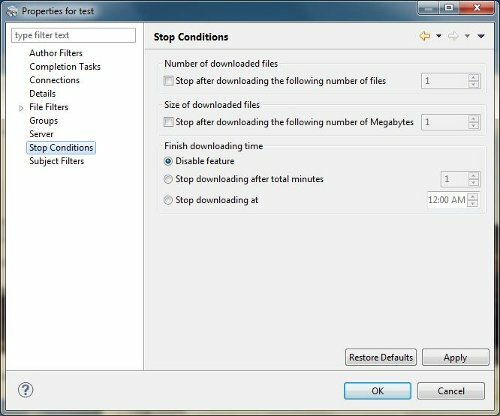 Disable feature - This option will disable the finish downloading time feature. Stop downloading after total minutes - This option will stop the collection process when the total number of minutes have passed. Stop downloading at - This option will stop the collection process when the system time reaches the specified time.